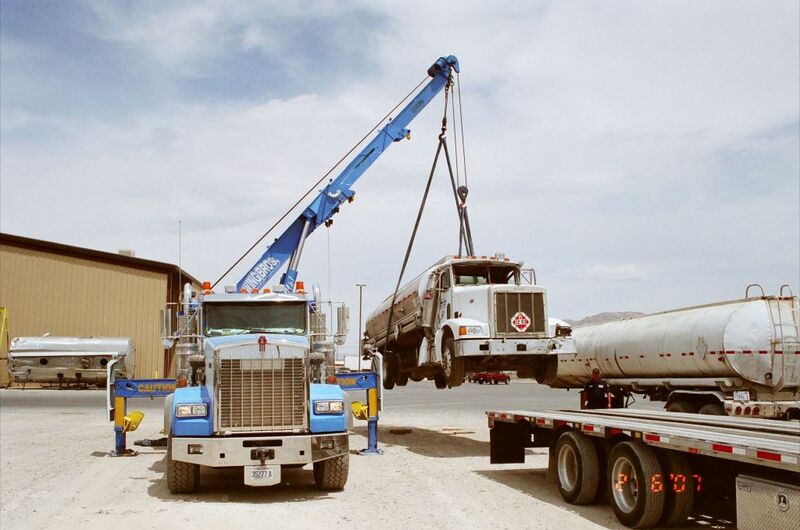 When it comes to Heavy Duty Towing there is no better choice than Ewing Bros. Our staff of Medium & Heavy Duty drivers are certified in both towing and recovery. All Ewing Bros. Medium & Heavy Duty operators are Certified OSHA Riggers in overhead lifting. Our team of operators were recognized by Wreckmaster Inc. for "Heavy Duty Recovery Excellence" in 2009 with the prestigious Donnie Award. Our team of operators have a combined experience of over 150 years with an employment average of over 15 years, so you know you are not getting some "rookie" handling your dilemma. 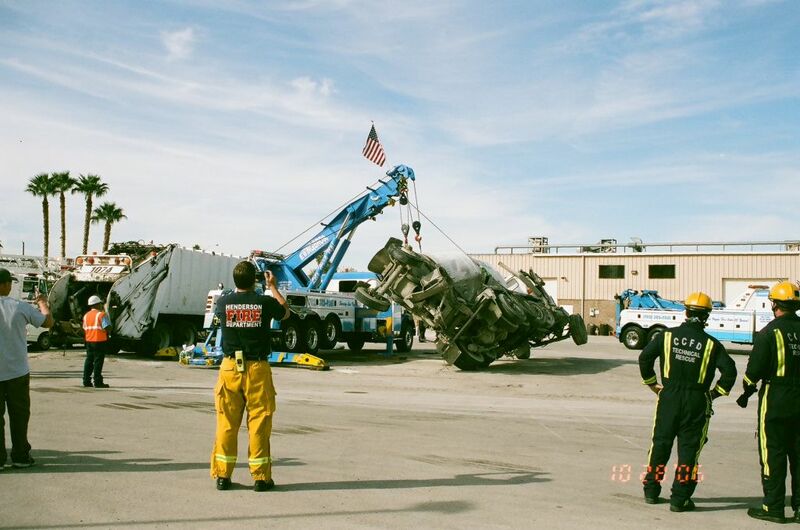 We at Ewing Bros. also train side-by-side with local fire departments and heavy rescue personnel. We have the most modern Medium & Heavy Duty equipment in the industry, ranging from 12-ton up to 60-tons. Our Flagship 60-ton Rotator is wireless remote controlled with "Certified & Rated Lifting Rigging". 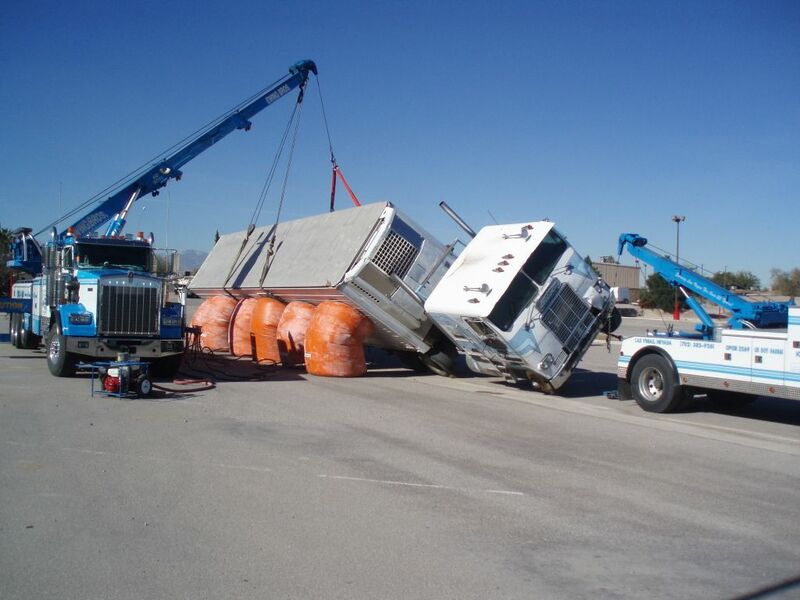 We have capabilities to upright a loaded 80,000-lb tractor trailers with our Air Cushion Recovery System. When a load shift occurs we can provide forklifts, pallet jacks and even dock capabilities in a moments notice. Our Heavy Duty Transport Division can supply you with lowboy access 24 hours a day, 7 days a week, so if you have a motorhome or a piece of construction equipment, we can haul it. 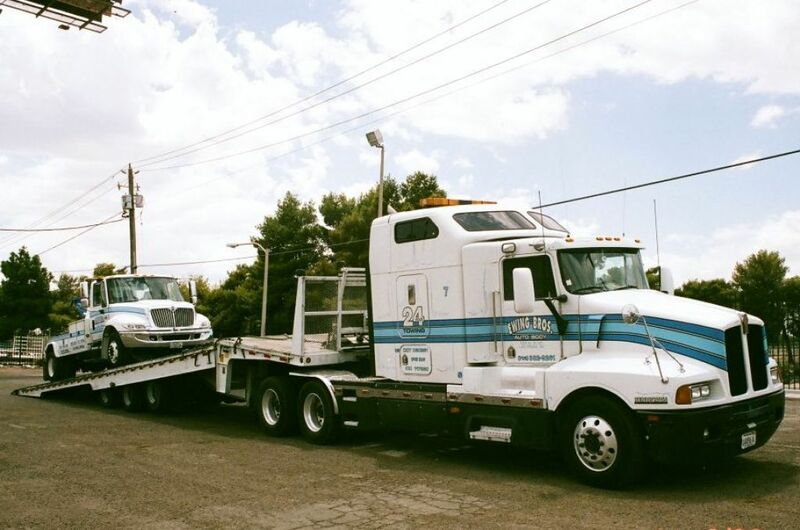 If you're in need of a long distance tow we can respond quickly to the rescue with a fleet of trucks that are licensed and permitted in 5 western states (CA, AZ, NV, UT, CO). Ewing Bros. operators are ready to provide you with a free, no obligation quote. Please call 702-382-9261, extension 265, or 266. From outside Nevada call us toll free at 1-800-467-0007.